Water has become a key environmental issue and with charges for its use and for sewerage services, it makes no sense for us to let gallons of free rainwater run off our roofs and straight down the drain. For this reason JDP supply a comprehensive range of plastic water butts for domestic rainwater storage. For the serious water user JDP can provide larger plastic tanks for rainwater storage, suitable for above ground, or underground tanks manufactured in Fibreglass (GRP). 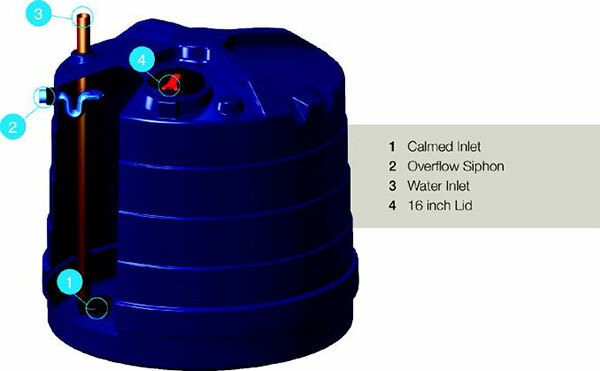 Both offer significantly larger volumes of storage than standard water butts. All tank installations must be sited on a fully supported flat base and comply with manufacturers instructions for the specific size of tank used. Efficient, compact and inexpensive, these rainwater storage units are a smart practical addition to any property. 1401WBSTAND Suitable for 190 and 200 ltr water butts. Other sizes available.